The past few months I’ve become quite obsessed with the foliage in my garden. 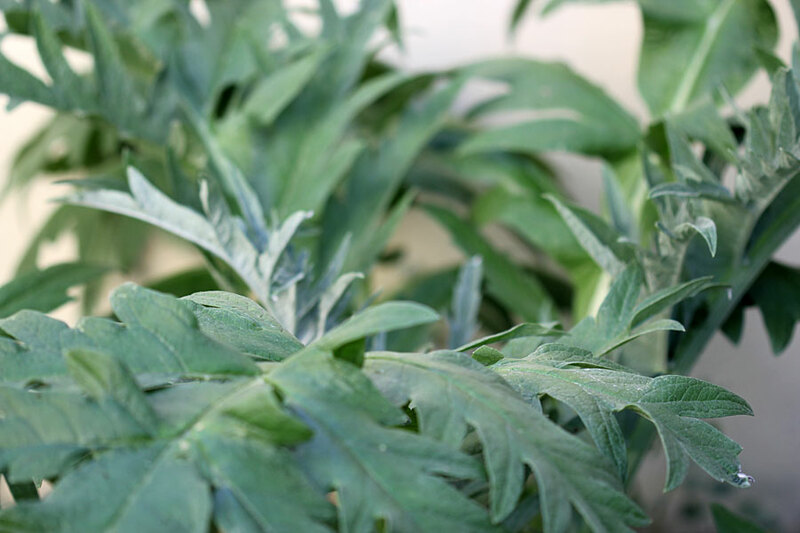 I’ve been concentrating on the look of plants and their foliage (rather than the blooms) and I’ve acquired a number of new plants bought purely for their lovely foliage or for the way they will look in the garden when combined with my existing plants. 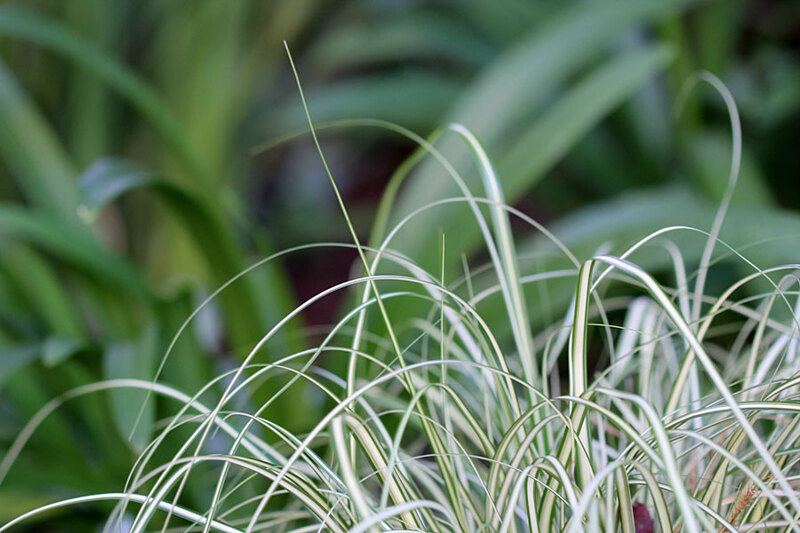 I think my favourite new acquisition is Festuca glauca which I first admired in my Gardening Mentors’ garden, Diana of Elephant’s Eye in Porterville. Diana has a real gift for beautiful combinations and the results are extraordinary! Without any further waffle, here are my latest “combinations” that I am enjoying at the moment – experienced gardeners, please jump in and tell me if you see something that is not pleasing to the eye – I am learning and don’t always see when things don’t gel well together. I appreciate constructive criticism – it helps me to grow as a gardener. 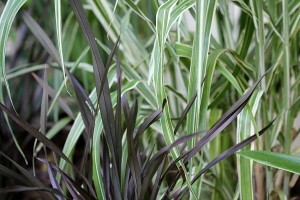 New: Miscanthus variegatus and ? 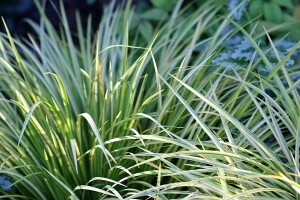 I’ve forgotten the name of the very last grass – I think its Pennisetum “something-or-other”. 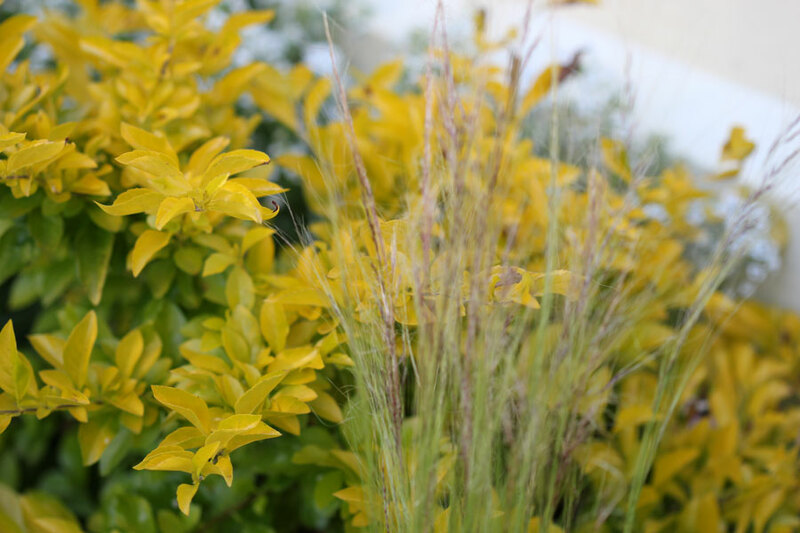 The last two photographs are of brand new combination plantings, so they still need some time to grow to show off their potential. 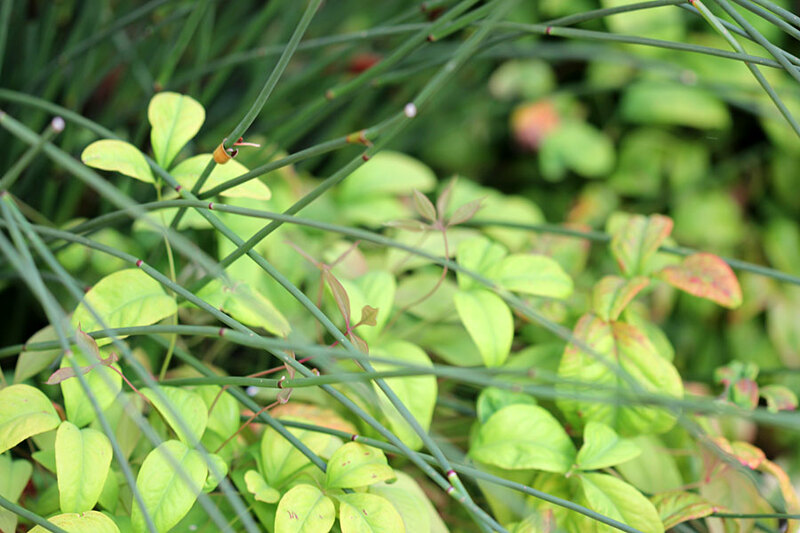 This month I need to concentrate on flowering plants again – this “foliage obsession” has resulted in very few blooms in my “November garden“, but the foliage is looking lush and great! 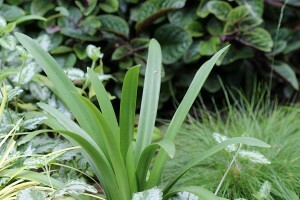 Below is a new combination I’ve just planted about a week ago. I planted the Artichoke a while back and because of its “upright” way of growing, its showing lots of bare ground below. 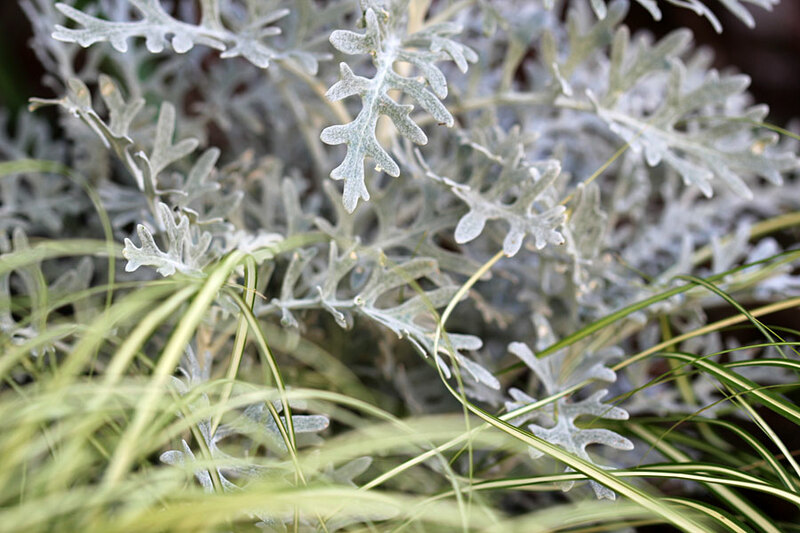 So I’ve planted the silver-hued Helichrysum petiolare below it as a contrast (I saw this on someones blog, I forget which one) and I loved the combination. I planted the Helichrysum only last week so it will need a few weeks to spread and fill out before I can see how it actually looks. Hopefully I will be able to show it next month, and I hope it looks good. 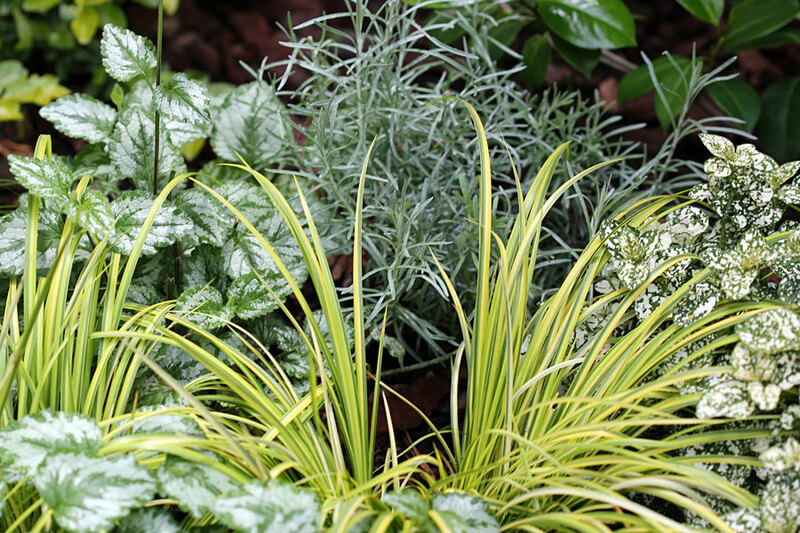 Here are the individual plants… What do you think – Good combo, or no? I’m thinking something “pretty” that flowers should join this combo, but not sure what yet. Any suggestions? 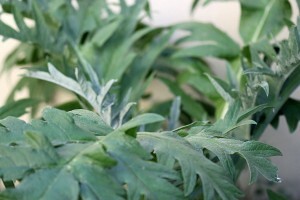 The spot is quite sunny – sunny enough for the Artichoke to be growing at a furious pace. 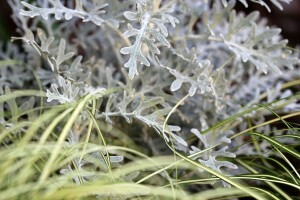 Today I’m linking up with Pam at Diggings for Foliage Follow Up. 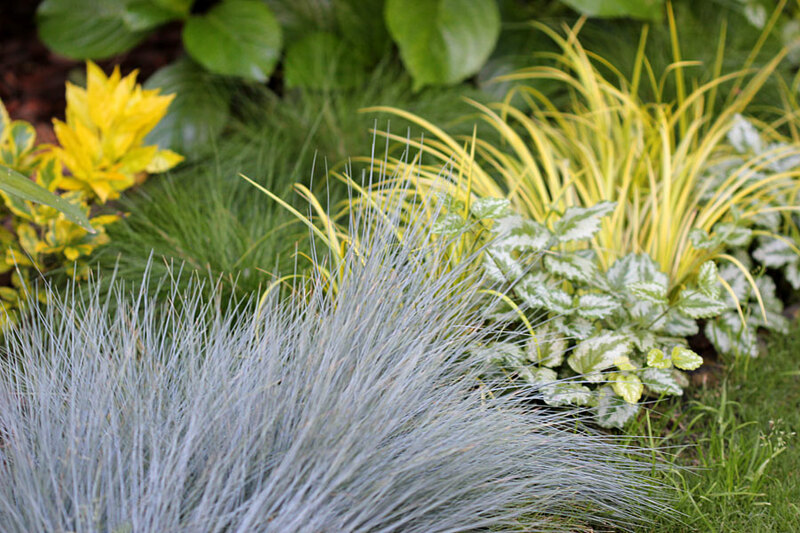 “Foliage Follow Up” is a monthly gardening meme where Pam and other garden bloggers showcase the beauty of foliage in their gardens on the 16th of the month. Some great combos! I especially love your combo of Duranta and Festuca scoparis. They look so pretty together! 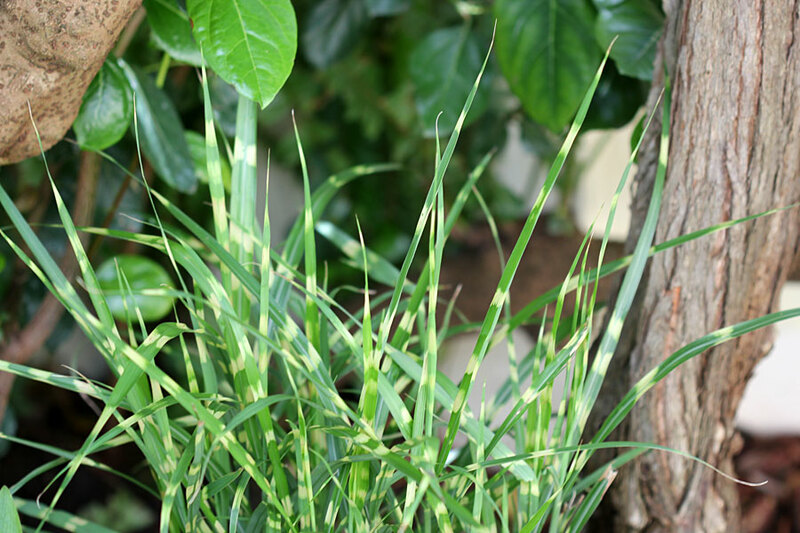 I’ve recently bought the variegated Acorus gramineus and am also in love! 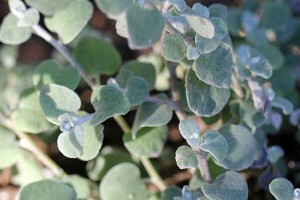 It is such a great plant. 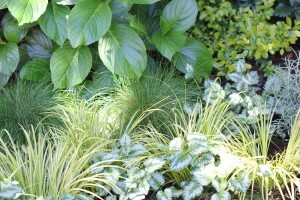 I am slowly working more grasses and foliage plants into my garden. It’s hard as I am a flower addict, but I really want to focus more on structure since plants are only in flower for part of the year. You’ve got some great foliage going on there! Love your combinations! And even though you may not have a lot of blooms, you have a lot of interest. 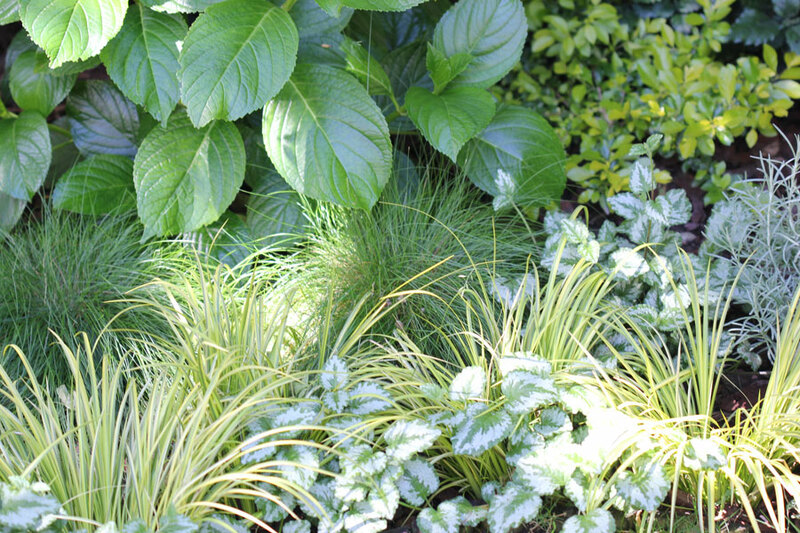 And as you say – you garden still looks green and lush and great! That is success! My red Pennisetum exploded up and out, then sulked off when I cut it back. One idea I had that hasn’t happened is some topiary balls for a Japanesy change of texture. Denise Noniwa in Holland? 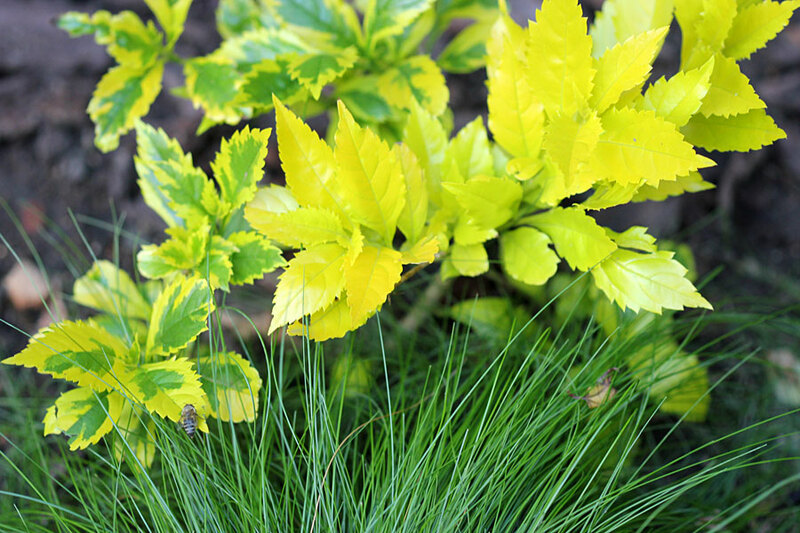 Wonderful foliage combo’s! Did you purposely only use photos with strappy accent plants in your first set? Or does your garden really have so much grass and grass-like plants that they are in every shot? Thank you Donna! I think I need to be careful now that I don’t overdo the grasses, I’ve just realised how many I’ve planted in the last few weeks/months. Great mixture of foliage. Actually they look really good and their beauty more lasting than flowers. Hi One – I agree, I really love foliage! Beautiful combos, Christine! 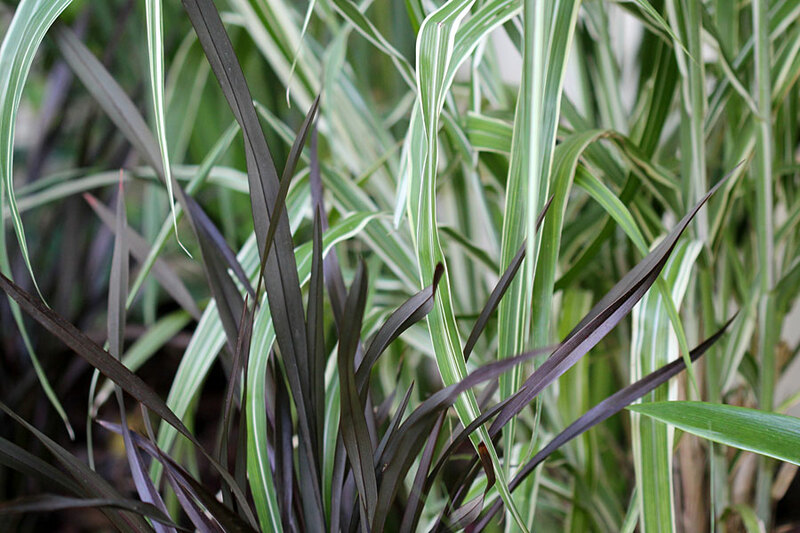 I love the contrast between the grasses’ thin, strappy leaves and the broad-leaf plants you have in your garden. Thanks so much for joining in for Foliage Follow-Up! Thanks Pam! So glad you approve – I’ve learnt a lot from your blog and love your gardening style! Beautiful combinations! I especially love the first photo. 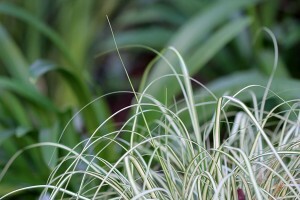 I can’t openly grow Festuca glauca because the rabbits love it and keep it mowed. That’s why I often envy your garden walls. Christine – I love your combinations. 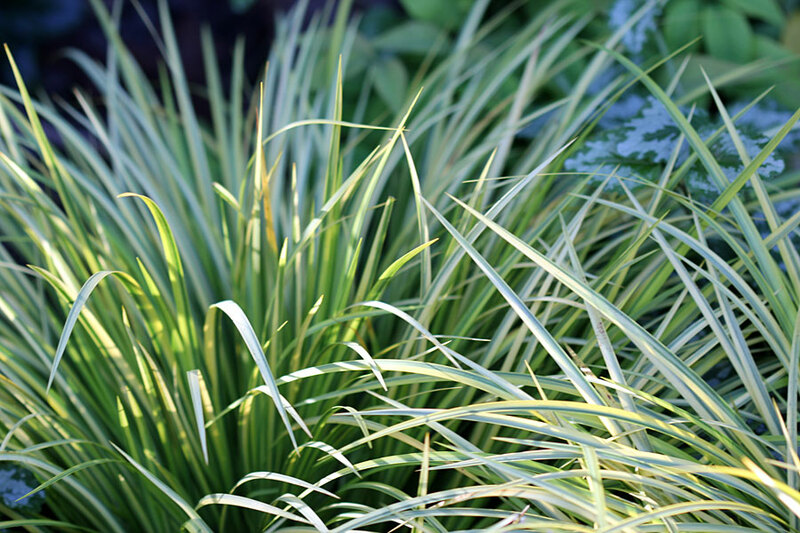 And I am particularly fond of grasses / restio’s and the varying shades of green / tinges of brown that they imbue into a garden. Given the state of the water supply in this country, I have made a conscious decision not to grow flowers for the sake of their colour, but will only grow them if they can also be eaten / used in preparation of a meal. Thanks Dani, so glad you approve of the grasses & combos. I find I need to water a lot less these days … am making wiser plant choices.